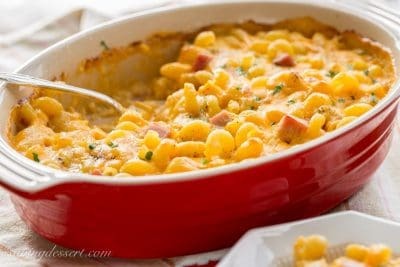 Creamy and rich ~ Ham Macaroni & Cheese ~ the perfect comfort food! 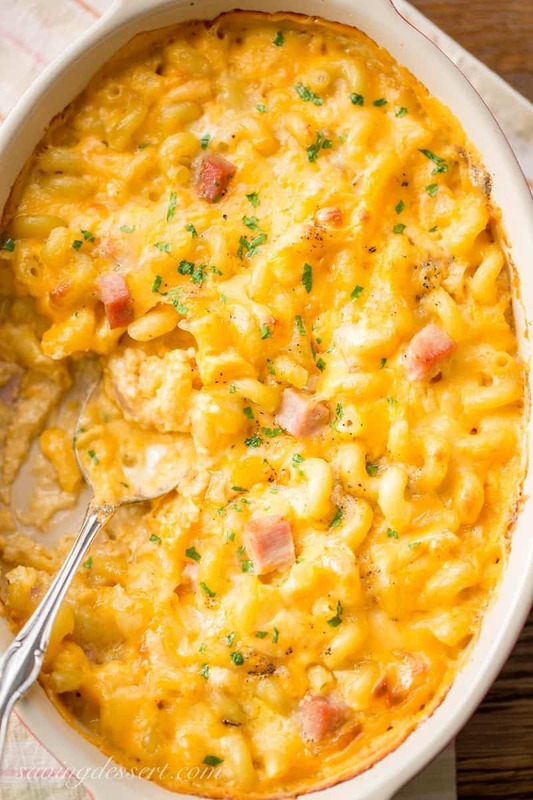 First, what could be more comforting than a steaming bowl of macaroni and cheese loaded with sweet ham? You’re right, this is not diet food, but it’s not January 1st yet! New Year’s resolutions don’t start until the new year – at our house anyway. I’m actually looking forward to more salads, simple vegetables, and hearty flavorful soups. And I’m ready to jump right back into my old exercise routine, but not until this leftover ham is gone! Isn’t it funny how the good habits fall away so quickly while the bad habits seem to be easy to do … all the time? Back to the treadmill! We don’t eat ham very often, but it’s such a great way to feed a crowd at the holidays. I especially love leftover ham for sandwiches, or added to scrambled eggs in the morning. There are so many great ways to enjoy ham, but not many that are better than ham and cheese! Ham and cheese goes together perfectly like peanut butter and jelly, or sausage and biscuits. In addition to good quality cheese, using evaporated milk in this recipe gives the sauce a thicker, richer texture. Evaporated milk (canned in the US), has had approximately 60% of the water evaporated from the original fresh milk. I have not tested this recipe for Ham Macaroni & Cheese using all fresh milk, but I think the taste would be great, however the sauce may be much thinner, which is not to say it would be bad. If you give it a try, please leave a comment and let us hear from you! Don’t forget to PIN to your favorite Comfort Food Board! 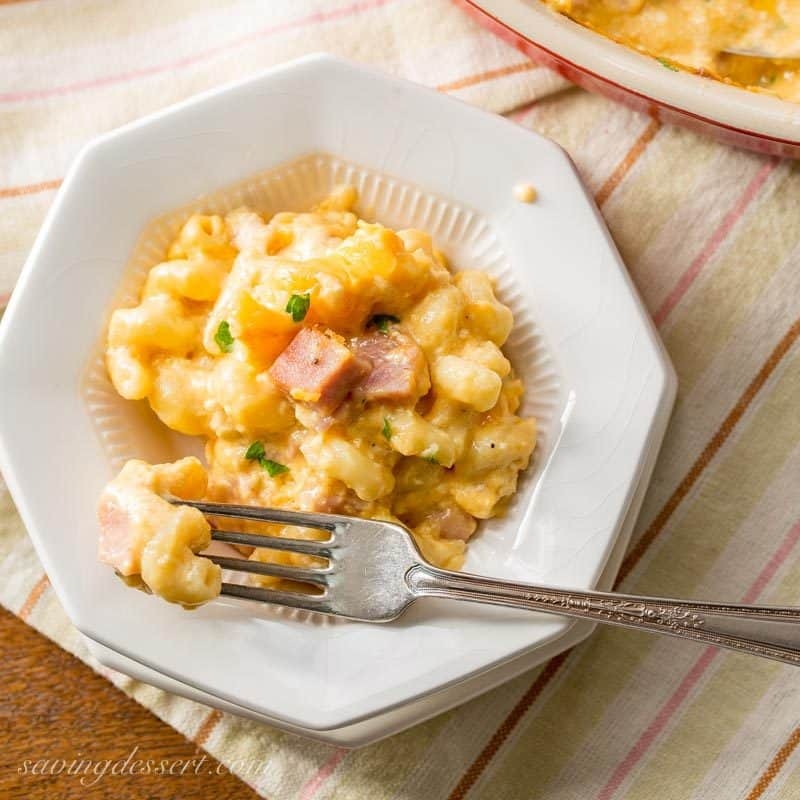 Creamy and rich ~ Ham Macaroni and Cheese ~ perfect comfort food! Preheat oven to 375 degrees. Lightly spray a 1 1/2 to 2 quart baking dish with vegetable cooking spray and set aside. Cook the pasta al dente, per package instructions. Drain well. Return the cooked pasta to the pot and add the butter. Toss to coat until all butter is melted. In a small bowl with a spout, whisk together the evaporated milk, regular milk, egg, cayenne and black pepper. In a separate small bowl or ziplock bag, combine the American, Gouda and Cheddar cheese. Spread 1/3 of the pasta in the bottom of the prepared casserole dish. Top with 1/2 of the ham. Sprinkle 1/3 of the cheese mixture on top of the ham and pasta. Repeat again starting with the cooked, buttered pasta, the remaining ham, and 1/3 of the shredded cheese. Finally, spread the remaining pasta and cheese on top. Pour the egg and milk mixture over the top of the casserole. Top with a few extra pieces of ham if desired. Bake until the casserole is set and lightly browned on top, about 30 minutes. Remove from the oven and allow the casserole to cool for 5-10 minutes before serving. Since the casserole includes ham, no additional salt is needed when cooking. To freeze the casserole, bake then cool completely. Wrap in plastic wrap and foil and freeze until needed. Defrost completely in the refrigerator, remove the wrapping and rewrap lightly with foil. Bake (covered with foil) at 350 degrees for 30 minutes or until warmed through. Finally, have you taken down all your holiday decorations yet? I guess we’ll wait until after the New Year so we can squeeze out a little more enjoyment from all that work! I hope you had a wonderful holiday. We enjoyed time with family, ate way too much food, and did not exercise enough. In my own defense, I’ve been sick for weeks – which was pretty awful at such a busy time of year. I had planned to make a lot of fudge, toffee and other treats as gifts, but ultimately none were made, nor gifted. Being sick is the worst! But I’m on the mend, and I am grateful. Thank goodness for New Year’s resolutions! Oh my gosh, when I first saw this on Facebook, Tricia, I was sure I hadn’t seen a Mac n Cheese that looks so delicious! Now when I’m visiting here I know that I must come to your house for a serving, lol, …or two…or more! Wow – so creamy and yummy and one of my favourite comfort foods! Awww thanks Robyn 🙂 Happy New Year!!!! I may have to forget about those resolutions for a bit and have a small helping of your mac and cheese. The days of ‘the blue box’ being long over, I truly crave a good homemade mac and cheese dish – especially in the winter months. Great way to use leftover ham! We don’t eat ham nearly as much as we used to also but good to know it’s always at the deli and they can cut it thick for dishes like this 🙂 Wishing all the best in the new year, Tricia! Happy New Year! People really enjoy the cookie posts Larry – but I’m also glad to get back to something other than dessert 🙂 Have a very Happy New Year and thanks! This is such great comfort food. I love it. Happy New Year Tricia! Makes you appreciate health so much when we feel better again..so grateful. Looks like real comfort food..big snow accumulation all day..I had 3 boys today..will take pics tomorrow..take care! Hi Tricia, so glad you are feeling better, tough to be sick over the holidays…… There is always room for comfort dishes like this at our house. Perfect meal for cooler weather. Ham and cheese is beautiful together. Happy New Year to you too Cheri! Looking forward to healthy foods in January! Our temperatures have been going up and down like a roller coaster—I think some comfort food is in order. I love the look of your mac and cheese and I have some ham in the freezer!!! Have a terrific holiday weekend!! Crazy weather 🙂 Have a very Happy New Year Liz! Thanks Greg – happy New Year! Oh, girl, we battled the crud a few weeks BEFORE Christmas, thankfully. It is the worst to be under the weather at Christmas! Hope you are full speed soon! This Mac “n” Cheese made my mouth water… I’ve missed that about your posts. LOL! I’m thinking this would be a hit with the grands (except for Andrew… who doesn’t like “fancy” mac ‘n’ cheese… he wants that Kraft out of the box kind!) LOL!!! Thanks Tanna! Boy I have missed you!!!! Kraft mac and cheese is pretty great for something from a box 🙂 I think all kids love that one. Blessings to you and hope you have a very Happy New Year! We’re crazy about good mac ‘n cheese and this looks like the good stuff! The ham would make it a meal in one! Love that! It is so filling Chris – so this recipe could feed at least 6. Add a salad and dinner is done! Hope you and Scott have a very happy New Year! This is just the kind of thing I love to have for breakfast, thanks for another great recipe Tricia! Such a comforting and wonderful treat! I too crave salads and veggies. Definitely had way too many cookies and cakes last weeks. Hi Angie! Thanks so much for stopping by. Hope you have a very Happy New Year! Can’t wait to see what you come up with in 2017!